Is it really November already?! I can’t believe that Thanksgiving is just three short weeks from tomorrow! That means we need to start talking about Thanksgiving food, and other than the turkey and mashed potatoes, what is more Thanksgiving than PIE?! Are you a traditionalist and bake up loads of pumpkin pie? Do you sprinkle in some fall pie staples like pecan and apple? 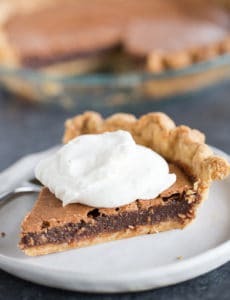 Do you go rogue and serve up things like coconut or chocolate cream pie? Whatever your favorite Thanksgiving pies are (and we’ll be talking more about pie varieties tomorrow! 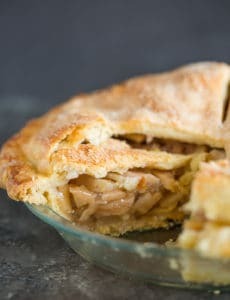 ), there is one prevailing issue many people have with their Thanksgiving pies – the dreaded crust. It can be super finicky, am I right? It took me YEARS and countless recipes to finally find that one perfect pie crust recipe. It’s the one I use exclusively now – it’s perfect for double crust pies, for blind baking, for literally any type of pie you want to make. THIS is best crust recipe I’ve found. It’s easy to work with, unbelievably tender and flaky, and it has one surprising, secret ingredient. 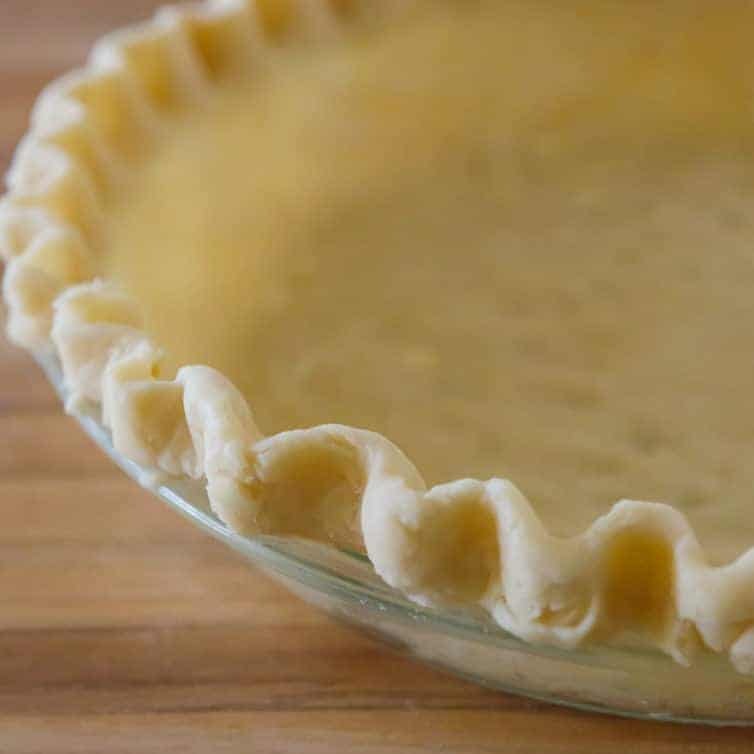 It’s astonishing that some pie crust recipes can be foolproof while others turn into a mess when they’re all made with mostly the same ingredients – flour, a little sugar, a little salt, butter and/or shortening, and water. It stands to reason, then, that the trick lies in the ratios and the technique. 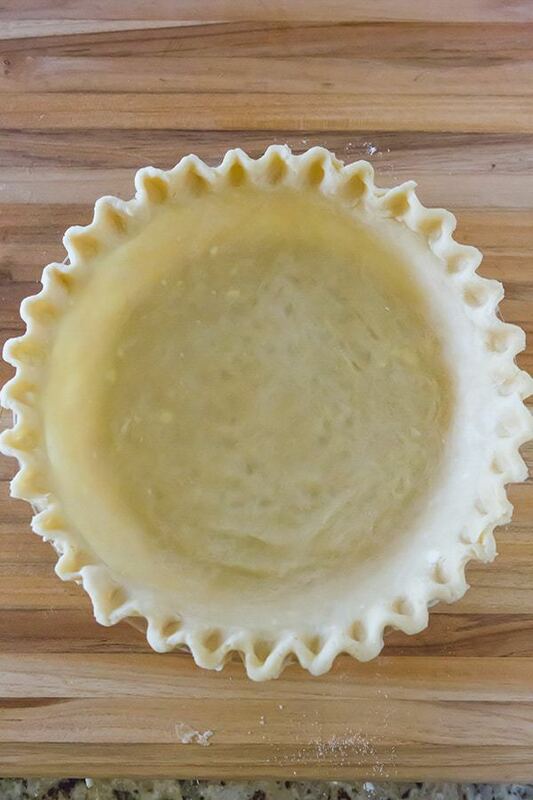 I had done all butter pie crusts, all shortening pie crusts, using a food processor, mixing by hand, and I was still having mixed results until I tried this recipe from none other than Cook’s Illustrated. Their recipe has a super ingredient that always shocks most people – vodka. Here’s the deal… when water mixes with flour (as it does in a pie crust), it forms gluten, and too much of it can create a tough crust, which affects the final texture, and can give you fits when trying to roll it out. Using vodka, which is only 60% water, gives the dough the moisture it needs, creates less gluten, and vaporizes in the oven, which means a super flaky pie crust. Here’s the kicker though – you cannot leave out the vodka or replace it with more water – it just won’t work with this recipe. 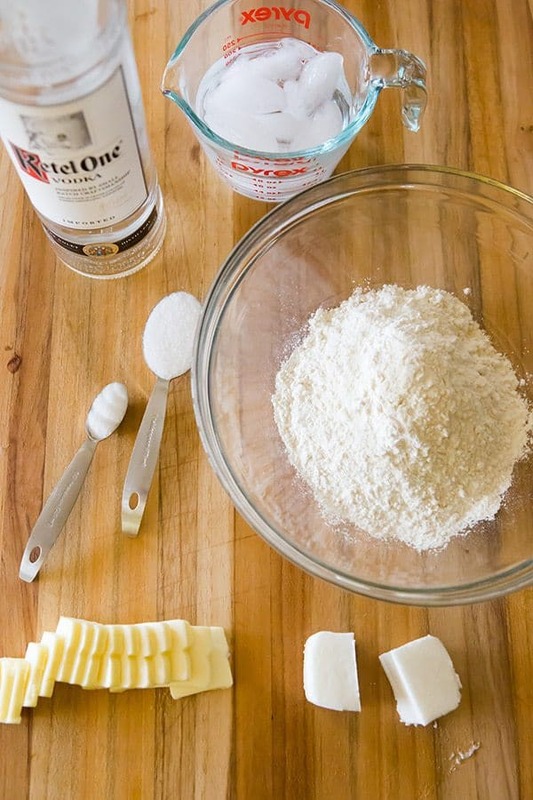 You can use another 80 proof liquor instead of the vodka, but if you want to avoid alcohol altogether, a more traditional pie crust is probably what you’ll need to go with. Don’t be surprised at how soft and supple this pie crust is – it’s much softer and malleable than others you’ve likely tried. It’s okay to add quite a bit more flour when rolling it out (up to a ¼ cup or so), as it’s factored into the recipe. So there you have it – my hands-down favorite pie crust recipe with its one magic ingredient. It makes ALL the difference! This is the only pie crust recipe I use nowadays, and there will be an abundance of it making an appearance in preparation for Thanksgiving. If you haven’t tried it yet, I hope you’ll give it a go and love it as much as I do! I cannot WAIT to dig into some homemade pies in a few weeks! 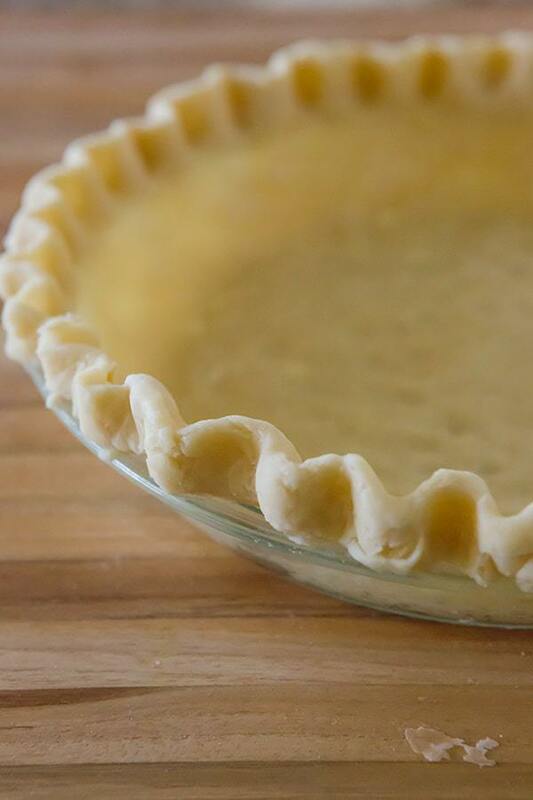 The BEST pie crust recipe you'll ever find! It's easy to work with, tender and flaky. You won't believe the secret ingredient! Process ¾ cups of the flour, the sugar and salt together in a food processor until combined, about 2 one-second pulses. 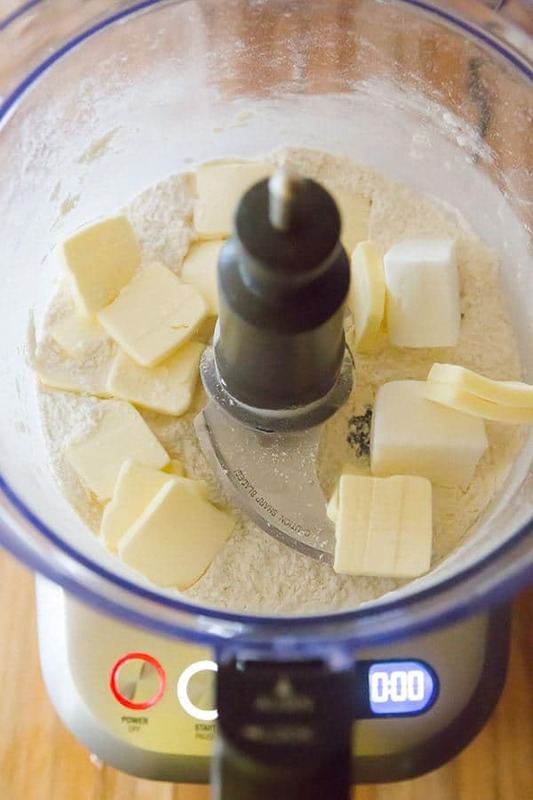 Add the butter and shortening and process until a homogenous dough just starts to collect in uneven clumps, about 7 to 10 seconds (the dough will resemble cottage cheese curds with some very small pieces of butter remaining, but there should be no uncoated flour). Scrape down the sides and bottom of the bowl with a rubber spatula and redistribute the dough evenly around the bowl. Add the remaining ½ cup flour and pulse until the mixture is evenly distributed around the bowl and the mass of dough has been broken up, 4 to 6 quick pulses. Empty the mixture into a medium bowl. Sprinkle the vodka and water over the mixture. With a rubber spatula, use a folding motion to mix, pressing down on the dough until it is slightly tacky and sticks together. Flatten the dough into a 4-inch disk, wrap in plastic wrap and refrigerate at least 45 minutes, or up to 2 days. 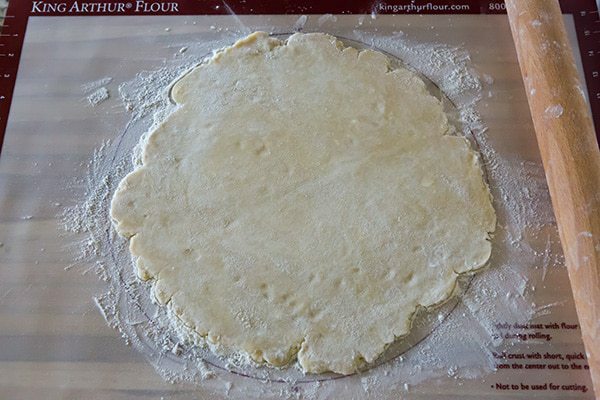 Remove the dough from the refrigerator and roll out on a generously floured (up to ¼ cup) work surface to a 12-inch circle. 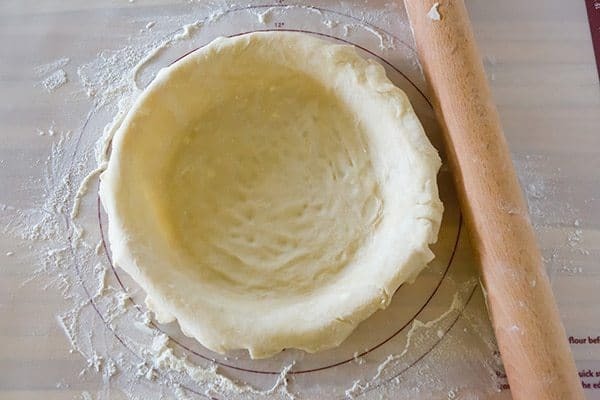 Roll the dough loosely around a rolling pin and unroll into a 9-inch pie plate, leaving at least a 1-inch overhang on each side. Working around the circumference, ease the dough into the plate by gently lifting edge of the dough with one hand while pressing into the plate bottom with other hand. Leave the overhanging dough in place; refrigerate until the dough is firm, about 30 minutes. 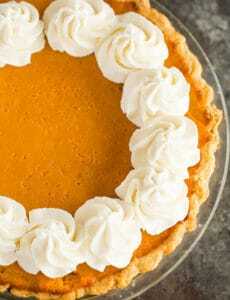 Trim the overhanging dough to ½ inch beyond the lip of the pie plate. Fold the overhang under itself; the folded edge should be flush with edge of pie plate. Flute the dough or press the tines of a fork against dough to flatten it against the rim of pie plate. Refrigerate the dough-lined plate until firm, about 15 minutes. Proceed with pie recipe as directed. Note #1: Vodka is essential in this particular recipe and cannot be substituted with more water. If you do not have vodka, use another 80-proof liquor. Note #2: For a double-crust pie, simply double the ingredients and use the same exact method. In step #2, divide the dough into two equal portions and wrap each in plastic wrap, then proceed with your pie recipe as written. Awwww girl!! WOW!! AWESOME!! DO NOT even begin to cover this or any of your recipes I’ve made and tried!! HOLY SMOKES not even close! I missed your post about the pix & Instragram but it won’thappen next time and there WILL BE a next time 😉😁😉 Did you by chance sometime back say something along the lines of “You wish you could be a Southern girl with all the wonderful Southern RECIPES you’ve made and loved?” Because if this is you, “Darlin’ consider yourself a Southern Belle. WELCOME TO THE SOUTH KATIE SCARLETT O’HARA!! You used to have another pie crust recipe on your site and I can no longer find it. It did not contain vodka. There were step by step instructions/photographs for mixing it with a food processor and then mixing it by hand. Can you point me in the right direction – I can’t find it now when I search. Thank you! Hi Marika! Is this the pie crust recipe/instruction you’re referring to? Best pie crust I’ve ever made. So flaky. Thanks for sharing.